Summary : Not your typical chinese restaurant green tea, that is for sure. The Green Osmanthus tea from Dragonwater Tea Company (now out of business) is light, refreshing and has just a hint of sweetness to it. A fine green tea, especially for people new to green tea. Review : After having an exceptional tea tasting experience with a Jasmine Oolong tea, I was really looking forward to trying the Green Osmanthus tea from Dragonwater Tea Company (now out of business). The reason for this is because green osmanthus is scented with osmanthus flowers, similar to way teas with jasmine are scented with jasmine flowers. In particular, I was very interested in seeing how this tea would smell. The Oolong Jasmine tea I tasted had a fragrance straight out of the flower garden...and I loved it! 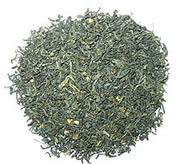 Here is how Dragonwater describes this tea on their website : "Green Osmanthus Tea. Green tea scented with Osmanthus flowers. Similar to jasmine, a layer of osmanthus blooms are placed between the fresh tea leaves allowing the leaves to absorb the delicate scent. The osmanthus blooms are then blended into the tea to enhance the visual appeal as well as boost the flavor. Osmanthus blooms are very delicate and the aroma from the blossoms is equally delicate resulting in mild peach flavor notes on the tea." To be truthful, I was initially just a bit disappointed when I ripped the top off of the package that the tea comes in. The reason...lack of any sort of fragrance. In short, I guess I was expecting another "jasmine tea experience"...where the house smells like a flower garden. Instead, I found this particular tea to have very little aroma at all. And what aroma it did smelled very much like a green tea. Hence my initial disappointment. However, I shoved aside that disappointment and gave this tea a chance. After brewing, the tea still had little aroma...unlike a jasmine tea. Yet, the taste was nice. Very nice, in fact. OK. The taste wasn't "flowery" by any stretch of the imagination...something I admittedly was expecting. Yet, the taste was pleasant. The flavor was very light, matching the color of the tea. And, probably best of all, there was just a slight "sweet" taste to this tea, which is a bit difficult to describe. Overall, I liked this green tea. I think most people enjoy green tea will like it as well...especially people new to green tea whose only experience has been with chinese restaurant green tea. Recommendation : Yes. This tea has a very light color and taste...wtih just a hint of sweetness. And the lack of any sort of bitterness allows the tea to go down nice and smooth. The tea also lacks an after-taste, making this a nice calm down and tea for bedtime.